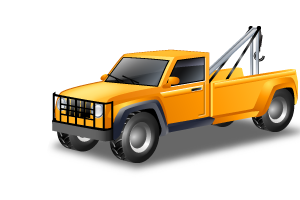 J&K Body and Paint offers services such as Light and Medium Towing, Roadside Assistance, and Relocation services. Based out of Ogden, IL, we service a 60 mile radius to anyone who needs towing assistance. Our rate on a normal hookup is $55.00 plus $3.00 per mile. For more information on pricing, please call 217-582-8083. We are equipped to tow all types of vehicles and light trucks with our lift systems safely and quickly. With our pop up dolly wheels, we can tow your vehicle with wheels lifted off the ground. This comes in handy for 4-wheel/front drive cars and light trucks that have suffered a flat tire and cannot be towed otherwise. You need not worry about the condition of the vehicle. We can also tow motorcycles of all types and models safely and damage-free. Our experienced staff is well trained in getting your towing job done quickly and safely throughout the year regardless of weather conditions. We handle service calls throughout the year in all weather conditions. This can include roadside tire changes, winch outs, jump starting and lockout assistance. Just give us a call and we will dispatch a professional technician to your location quickly. This can be life safer in the harsh weather we see throughout the year in this area. We have plenty of experience in providing roadside service to vehicles that are disabled and getting them back on the road quickly and safely. J&K Body and Paint tows for all the local agencies throughout the area through all weather conditions. We are equipped to handle any type of accident safely. You can feel safe that your tow will be handled safely using the latest traffic control equipment including arrow boards and air bags. We can also store your damaged vehicle in our storage area. Let us handle your accident needs and you can be sure of your total satisfaction in our service. Whether you need to relocate an unauthorized vehicle or one that is trespassing in your private lot, look to us for assistance. You will not be responsible for any fees as the registered owner of the vehicle must pay for them personally. Just call us and we will dispatch to the location and promptly remove the unauthorized vehicle safely and quickly. You can rest assured that our drivers will handle the situation in a fair and courteous manner. Providing damage-free service is essential in preventing any unfair damage claims which may arise. This service is especially helpful in addressing constant offenders or the occasional trespasser.